Photographer Karl Gohl used a remote control to photograph himself atop Goat Rock. 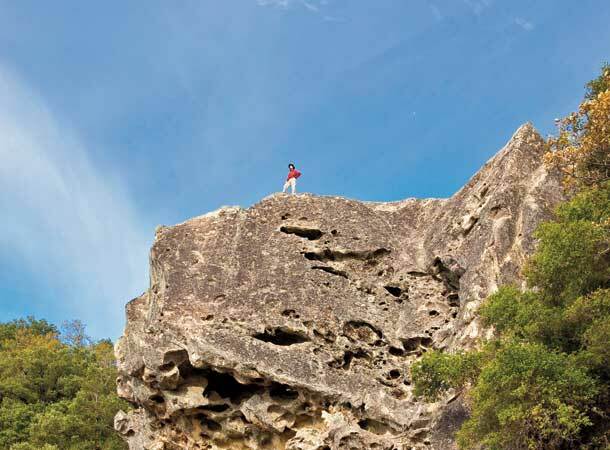 Like many local climbers, he learned to climb on Castle Rock State Park’s exposed sandstone cliffs. Earth shapes vast portions of itself into waves–sand dunes, sea swells, mountain ranges, even pressure ridges in the atmosphere. Wherever they crop up, the big combers tend to attract the most attention. That’s true out on the bounding main of the Pacific Ocean, and it’s true in the 5,000-acre sprawl of Castle Rock State Park. Up here, pale, round outcrops of smooth sandstone jut like foam bubbles from the lofty crest of one of the tallest ridges in the Santa Cruz Mountains. From that 3,200-foot-high eminence, visitors can observe lesser ridges marching down to the coast like a half-frozen set of grand blue waves. Bay Area ueber-rock band Jefferson Airplane once sang, “Life is change, how it differs from the rocks.” Not these rocks. Constant change and flow is their special metier. The Vaqueros Sandstone formation underlying Castle Rock park and its surrounding area was once a broad sea floor, 30 to 40 million years ago. In winter and spring, Castle Rock Falls, on Kings Creek near the Saratoga Gap trail, plunges about 80 feet down the rocks. Photo by Damon Tighe. Vaqueros Sandstone formations are found at spots around the Central Valley and at locations in the northern and southern Coast Range. Whether it was all originally formed in a single location and then broken up is not known. It could have been formed by similar conditions off the mouths of many ancient rivers during that era. In many areas, Stoffer says, the formation is just a few feet thick. But in the Santa Cruz Mountains, it crops up in a uniquely coherent mass, more than 2,000 feet thick. The sandstone, a mix of quartz and feldspar crystals lightly glued together with organic compounds from ancient sea life, continues its journey today. Tectonic upthrust here matches or exceeds annual erosion, so the stone moves ever higher, and elements migrate within the rock, dramatically sculpting the shapes of exposed knobs of stone. Rainwater infiltrates the rock and dissolves calcium carbonate and other glues within it, then transports them back out to the rock surface via capillary action. Here they harden and armor the outer surface with a shell up to several feet thick. Meanwhile, unglued inner grains crumble, hollowing the outcrops from within. Such sculpted shapes, called tafoni, have built the large and distinctive forms of Castle Rock itself, Goat Rock, Skull Rock, and other smooth and bulbous nodes that attract and awe hikers and climbers. A rock climber ascends Goat Rock, a good destination for beginning climbers. The sandstone here is part of the Vaqueros Formation, which, though widely distributed in Central California, is unusually thick in the Santa Cruz Mountains. Photo by Ron Dell’Aquila. Many waves of human visitors washed over these ridges, both long before and well after Vancouver. Former Castle Rock ranger Miles Standish (retired in 2009 after nearly 30 years at the park) says no evidence has been found of permanent Ohlone tribal villages up here, but there was seasonal movement through the area that became the park. Hunting and gathering parties likely came from the Achistaca group, which lived at the headwaters of the San Lorenzo River, and the Quiroste group, dwelling on the coast near Ano Nuevo. These Quirostes greeted Gaspar de Portola peaceably when his ragged band straggled up the coast in 1769. But they later fomented armed rebellion against the mission system, using the rugged ridges of the interior as their stronghold. A century and a half later, the park became famous for strongholds of another sort: Bay Area rock climbers love the unique sandstone formations. One such was Russell Varian, a pioneer of X-ray and radar technology who was also a recreational climber and ardent conservationist. After his death in 1959, a donation from his family paid for 27 acres that became the seed for Castle Rock State Park. Views from the eroded sandstone heights here give ample evidence of the tectonic forces that have pushed the land up into a series of tall ridges. Photo by Frank S. Balthis. Langdoc himself learned the ropes here in the 1960s. Like many Bay Area climbers, he graduated to longer, tougher routes in the Pinnacles, Sierra granite, and finally peaks across the globe. Doug Robinson, John Yablonski, Jim Bridwell, Ron Kauk, and Chris Sharma are some of the alpine luminaries who nursed their fledgling talents at Castle Rock. Now, this area is famed as a world-class area for “bouldering” (low-altitude, high-difficulty, unroped climbing). All of the climbing routes at Castle Rock are short, and many are easy, but a few, like this one, are more difficult. The park is also known for good bouldering (low climbing without ropes). Photo by Randy Reddig. Routes with picturesque names like “Lunatic Fringe” and “Ecoterrorist” celebrate the emotions climbers feel as they tackle the tough moves. “Chimps in Negligees” speaks to their whimsy, while “The Beak,” “Skull Rock,” “Mud Wall,” and “Ironing Board” suggest aspects of the rock formations themselves. Zeke Federman, cofounder of the Castle Rock Climbing School, learned his own moves here while growing up in Santa Cruz. Now he mostly guides in the Sierra, but still finds Castle Rock an excellent destination for seminars and lessons. Two decades ago, I was one of these climbers. The lessons I learned about balance, focus, and safety eventually transported me from the park’s user-friendly sandstone to the sheer granite cliffs in Yosemite. During that evolution, I merely followed the chalk-marks of my predecessors. While its exposed geology is outstanding, Castle Rock is definitely not just a rock garden. Apart from those famed outcrops, the park lies thickly cloaked in a variety of vegetation types, ranging from redwoods and tanoaks in the stream corridors to diverse oak-madrone woodlands to dense chaparral. Plenty of the sandstone substrate has decomposed into the sandy soils beloved by evergreens. Ken Himes, a Belmont resident active in the Santa Clara Chapter of the California Native Plant Society, has hiked these trails and compiled plant lists in the park. Cycles of rain and drought cause complex erosion patterns called tafoni (from a Corsican word for “window”). The compounds that cement the rock together dissolve and harden again on the rock’s surface and along cracks, creating a hard shell around now-uncemented rock. When the hard shell breaks and the soft rock erodes away, only the “cracks” remain. Photo by Alan Justice. Map by Ben Pease, peasepress.com. Click for larger version. All this, the sculpted rocks, the fragrant forests, the gymnastic climbers, the brilliant native plants, can be seen by walking Castle Rock’s 35 miles of trail. The easy option is to select day-hike loops of a few miles between Castle Rock and Goat Rock. The 5.5-mile loop on the Saratoga Gap and Ridge trails covers all these diverse habitats and passes the Goat Rock climbing area. From the Saratoga Gap Trail, you’ll get an expansive view out across the whole San Lorenzo River watershed, down to Monterey Bay and the Santa Lucia Mountains beyond. Another highlight of this route is Castle Rock Falls on King Creek, which pours 80 feet down a huge mottled slab of sandstone. These highlights can be seen without surrendering a lot of elevation. The park’s other top option is all about surrendering elevation: The famed Skyline-to-the-Sea Trail undulates over 34 miles to reach sea level at Waddell Beach. Two friends and I made this trail part of a grand adventure in May 2009, hiking from San Jose to the sea in just three days, a trek covering 54 miles, with a total of 8,600 feet of elevation gain and loss. Much of the ground we traversed across the waves of ridges descending from the heights of Castle Rock State Park had been preserved by some of California’s earliest open space advocates–with more in the sights of today’s conservationists. In April 1900, photographer Andrew Hill, angered by the scorched-earth tactics of early timber practices, led a group into Big Basin, giving birth to the Sempervirens Club and a campaign to preserve the region with a series of public parks. The $32 Hill collected to initiate his crusade is dwarfed by the $40 million the renamed Sempervirens Fund has since raised and spent to preserve 23,000 acres, 21,000 of them in the Santa Cruz Mountains. The fund has had a hand in the creation of state parks at Big Basin, Butano, Portola Redwoods, Ano Nuevo, Waddell Beach–and Castle Rock. A black oak shoot leafs out in spring at Castle Rock. Ken Himes, with the California Native Plant Society, says the park has some of the best mixed stands of oaks in the Santa Cruz Mountains. Photo (c) G. Dan Mitchell, gdanmitchell.com. Baby blue eyes in bloom in April. Photo (c) G. Dan Mitchell, gdanmitchell.com. The present extent of these parks is dwarfed by the fund’s grand vision of a Great Park Planning Region, an expanse of 215,000 acres that could contain all these parks while linking them with wildlife corridors to nurture a largely intact Santa Cruz Mountains bioregion. Another step was taken toward this goal when the fund recently boosted Castle Rock from 3,600 acres to more than 5,000. The newly added San Lorenzo River Redwoods property lies just to the southwest of the San Lorenzo Headwaters Natural Preserve, an official delineation within the park where off-trail travel is prohibited. The new redwood grove addition is even more restricted; only scheduled visits guided by Sempervirens Fund docents are presently allowed. Despite the park’s growth in acreage, public access hangs in the balance because of budget troubles now afflicting the entire state park system. Castle Rock State Park’s new “lone ranger” Jason Rule (who assumed that honorary nickname from the retiring Standish last June) says access is bound to be constrained for a time. Despite the state parks’ woes, plans for new trails and for climbing access are steadily, if slowly, making their way toward implementation, thanks to the kind of volunteer spirit and dedication that gave birth to Castle Rock. Ardent fans of the park, such as Al Lisin, 77, and Martin McDonald, 74–volunteers who’ve maintained trails for the Santa Cruz Mountains Trail Association for decades–stay on the scene like hardy perennials, relishing the natural beauty while laboring to keep the park’s pathways open to the public. As long as other park fans follow in their footsteps, Castle Rock can continue to enchant waves of visitors for years to come. The park entrance is on Highway 35 just west of Saratoga, 2.5 miles southeast of the junction with Highway 9. From the Peninsula, take I-280 to Highway 85 to the Saratoga Avenue exit (Saratoga becomes Highway 9). From the East Bay, take I-880 to Highway 237 to 85. Paul McHugh is a Northern California outdoorsman and writer. His novel Deadlines, a murder mystery that centers around a local land-grab conspiracy, was published in February 2010. Info at paulmchugh.net.